James Ponbu, 43, had his arm amputated by rebels in January 1999. After receiving medical treatment at the Connaught hospital in Freetown, he tried to return to his job at the canteen of Fourah Bay College but was not accepted back. He has found it hard to get work ever since, despite having a college degree. Even his friends shun him: “People barred me from entering their compounds as they thought I’d just ask them for money,” he told IRIN. Cutting off peoples’ limbs - in most cases their hands - was one of the brutal strategies used by members of the Revolutionary United Front to terrify people to support them. 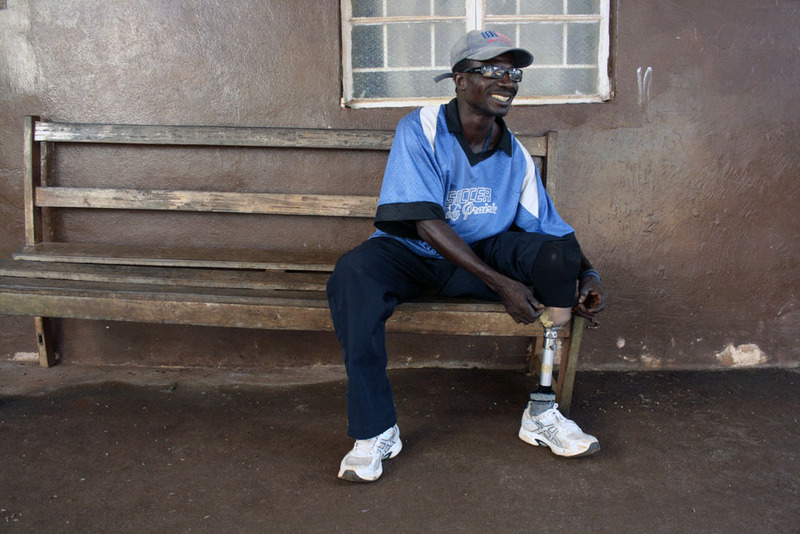 Some 27,000 Sierra Leoneans are estimated to have been disabled or have had one or more of their limbs amputated during the 1991-2002 civil war. In 2004 the Truth and Reconciliation Committee (TRC), set up to try to deliver accountability for human rights abuses, issued a report recommending that amputees, war widows, children, victims of sexual violence and the seriously war-wounded, should receive reparations in the form of free education for children, free health care and skills training to be managed by the National Commission for Social Action (NaCSA). Victor Vandi, 37, is a single-leg amputee. A father of eight, he works as an electrical and radio repair-man - a trade he began before the war. He also plays as a midfielder in Freetown's amputee football team. NaCSA gave him $200 and also built him a house. "The government should open a special vocational training school where we can learn to make prosthetic limbs and then we could supply ourselves," he told IRIN. Vandi received his prosthetic limb from NGO Handicapped International. Before the war, Edward Conteh (lead photo), current president of Amputee and War-Wounded Association, was a mechanic and construction machinery driver working on Sierra Leone’s hydroelectric dam project. In 1999 the RUF rebels amputated Conteh’s left arm a few inches below the elbow, with an axe. He was hiding in the mountains around Freetown with his family but had to risk returning home for food and water. On one such trip home the rebels caught him and his friend and amputated both of them. The Revolutionary United Front (RUF) were fighting ECOMOG (Economic Community of West African States Monitoring Group) for control of the eastern part of the capital at the time. "Four men were killed in front of my eyes. I still feel traumatized whenever I think about it... They saw I was strong, so they pointed guns at me, kicked me to the floor and stood on my hand. Then they cut my arm off with an axe." Showing his stump, he told IRIN: "This is not a house that can be burned and rebuilt back again. You cannot rebuild this. So it was my own problem to deal with." "After it happened, I went to stay at the Aberdeen amputee camp. I said to myself, 'What can I do now? I can't go to the streets and beg. I was a self-made man.' I knew I couldn't do mechanics again. So I decided to do photography - I would photograph marriages and go around the city taking portraits. But I don't do that any more because the photos don't come out well - my hand shakes." Conteh registered with NaCSA in 2008 and in 2009 received $70 from them. In 2011, he received a further $213 from NaCSA. "Three hundred thousand leones [$70] will not take you anywhere these days. In education, or even for health care, it can't take you anywhere… The government really is doing nothing now. The money we received was from the UN peacebuilding fund. The Lomé [peace agreement] said the government and international community should do something for us. "If anything, I want to see our children educated - very few children of amputees go to school. "Now 10 years after the end of the war, the majority of amputees feel they are finished in life. They feel worthless and there is nothing they can do for themselves." Since then of the 32,000 people registered, 20,107 have received only a cash handout of between US$70 and $200, and 12,000 have received nothing at all. NaCSA also provided fistula surgery for women who had been raped, and gave some emergency medical assistance (such as bullet-removal) to the severely war-wounded, said Sattie Kamara, NaCSA reparations programme outreach coordinator. She admitted the government should be responsible for reparations but said NaCSA did not have the funds to do anything more. It dedicated $319,000 of its own budget, and relied on US$3 million provided by the UN Peacebuilding Fund to cover the handouts. Previous reparations manager Amadu Bangura estimated it would take US$14 million to run the reparations programme. Poor planning is also to blame, as arrangements need to be set up with the ministries of health and education, but discussions “take time” and have thus far not led to much, according to Kamara. The government has estimated in the past that some 100,000 people would be eligible for reparations. The Sierra Leone amputee association, set up in 2000 to represent amputees, tries to help, giving food and clothing when it can, said chairman Alhaji jusu jaka Ngobeh, but it relies on help from churches, mosques and a few NGOs. NGO Fambul Tok (Family Talk in local language Krio) brings together victims and offenders at the village level to talk about atrocities that were committed, as part of a community healing process. Though reparations are not involved, when they can, perpetrators sometimes offer financial support to help the victim or their family. Some say this is a more sustainable, practical form of reparations, given the sheer extent of the suffering that took place across the country. On a day-to-day basis, most amputees in Freetown survive by begging as even those who are educated beyond secondary school level find it hard to get work, said Vandi Konneh in Freetown. A lucky few find work on construction sites or collect firewood and coal, he said. Rather than attend school, most of the children of amputees also beg as their parents cannot afford to pay their school fees. The standard $70 handout was useful to cover his basic food and clothing needs, but was not enough to help him rebuild his life, he said. The amputee association has pressured the government to act on the TRC recommendations, but to little avail, said chairman Ngobeh. In May of this year the Ministry of Social Welfare did a survey of street beggars in urban areas, many of whom are amputees, with a view to advocating more help, according to Social Welfare Minister Dennis Sandi. Despite little progress since 2004, Kamara said survivors of war atrocities must not give up hope: ministries are still working out how to implement the reparations programme.